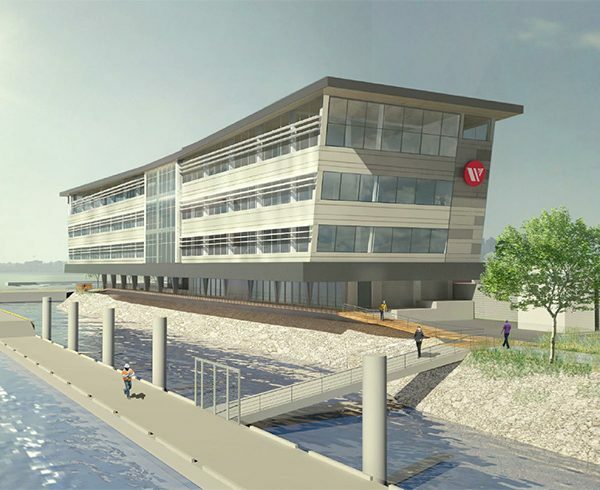 The 8-storey 84,000 sf new corporate headquarters will house 350 Seaspan staff, up from current 130, from across its various companies. It includes state-of-art office space, meeting rooms, expanded bike storage, electric vehicle charging station, and a full service cafeteria. The building incorporates a number of green building standards such as passive heating and reduced water use. The project is part of the National Shipbuilding Procurement Strategy (NSPS), which also includes the $170 million Shipyard Modernization Project, as it gears up to build 17 non-combat ships for the federal government. Atlas worked closely with the GC to establish a functional window cleaning system for the East façade of the building. The challenge was, the façade was directly over the water and when there is a high tide, the landing for a window cleaner is non-existent. Atlas proposed 2 access and egress hatches at the North and South ends of the landing on level 2 so that the window cleaner could exit the ledge once at the bottom, without entering the water. A custom, under hung, aluminum beam was also fabricated to address the overhang on the East Façade. The beam allows for a window cleaner to be within reaching distance of the glazing that is located directly under the overhang.